Mac DVD Toolkit - Mac Video Converter, copy and create DVD on Mac even transfer iPod to Mac. Mac Video Converter, rip and clone DVD on Mac even iPod to Mac Transfer. 3herosoft Mac DVD Toolkit delivers all the essential tools for DVD fans. 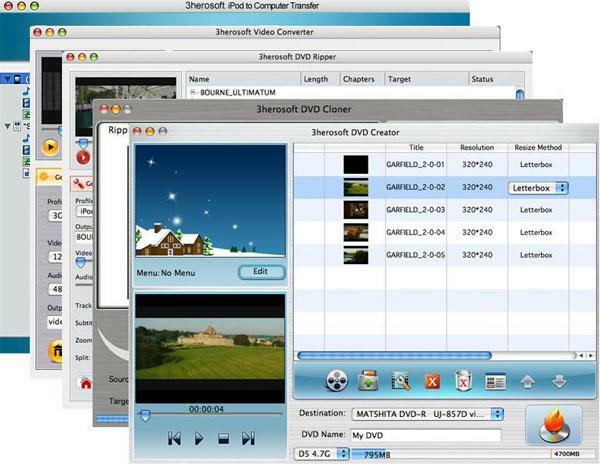 The super DVD package includes: DVD Ripper for Mac, Video Converter for Mac, DVD Cloner for Mac, DVD Creator for Mac and iPod to Computer Transfer for Mac. The toolkit enables Mac users to rip and convert DVDs to almost any video and audio formats, create and burn DVDs from videos, duplicate DVDs, convert amongst videos and audios, and extract audio from videos. 3herosoft Mac DVD Toolkit is an easy-to-use iPod and iPhone to Mac transfer; iPad, iPod and iPhone rip; iPod, iPad and iPhone backup software can fast transfer, rip, copy and manage your Music, Video, Photo, Ringtone, , ePub, PDF, Camera Roll (iOS 4 above), Voice Memo, Podcasts, TV Shows, SMS, Contact, Call List from iPad, iPod, iPhone to Mac. In addition, this Mac DVD toolkit is also a professional video conversion tool, aside from videos or audio interconversion; what's more, it can surprisely offer a wide range of editing capabilities such as splitting the file, trimming the title and chapter, customizing the DVD menu, previewing the video, selecting subtitles and audio, and much more. Let 3herosoft Mac DVD Toolkit makes your digital life vibrant and rich. Start enjoying your favorite movies anywhere! License Type: Free to try, $59.00 to buy. iTunes 9.1 or later is needed to support iPad OS 3.2.2. Keep well on iOS 8 and iTunes 12. Work well with all types of iPod/iPhone/iPads including iPad, iPad 2, the new iPad, iPad 4, iPad mini, iPod classic, iPod nano, iPod nano 5G, iPod nano 6G, iPod touch, iPod touch 4, iPod shuffle, iPhone 3, iPhone 4, iPhone 5, iPhone 5S/5C, iPhone 6/6 Plus, etc. Easily convert DVD movies or other all video formats to iPod video MPEG-4 and H.264/MPEG-4 AVC. 3herosoft iPod to Computer Transfer for Mac is professional iPod to Computer transfer, iPod rip, iPod backup software can fast transfer, rip, copy and manage your music, movie, photo, ePub, pdf, audiobook, voice memo, Podcast and TV Show between iPhone or iPod and Mac computer even without iTunes. All formats compatible with iPhone and iPod are supported. Moreover, 3herosoft iPod to Mac Transfer helps you create, edit and delete iPhone and iPod playlists. 3herosoft DVD Ripper for Mac is powerful and easy to use DVD Ripping software designed just for Mac OS X (including Mac OS X 10.10 Yosemite, Mac Intel) users. It can rip DVD movies to almost all popular video formats such as WMV, 3GP, AVI, MPEG4, RM, DivX, MOV, XviD, MKV, FLV, SWF, etc. and it can also rip DVD Audio to almost Audio formats including AC3, M4A, MP3, WMA, WAV, AAC, etc. with super fast DVD Ripping speed and excellent quality! 3herosoft Video Converter for Mac is the best video converter software designed just for Mac OS X (including Mac OS X 10.10 Yosemite, Mac Intel) users. It can convert among all popular video and audio formats with fast conversion speed. Such as convert AVI to MPEG, WMV to AVI, WMV to MPEG-4 or H.264/MPEG-4 AVC video, 3GP to MPEG, etc. 3herosoft DVD Cloner for Mac is fast DVD clone software for Mac OS X users to backup D9 and D5 DVD movie collection to blank DVD discs (D9 to D9 and D5 to D5) . With this excellent DVD burner, you can easily get your DVD copies which remain 100% same to the original DVD movie Discs. Moreover, 3herosoft DVD Cloner for Mac can back up DVD movie to DVD folder or ISO files on your hard disc. 3herosoft DVD Creator for Mac is powerful DVD maker software for Mac OS X users to easily convert and burn all popular video files such as AVI, MPEG, DAT, MPG, WMV, ASF, MP4, H261, H264, DV, 3GP, 3G2 and VOB to DVD for backup. Also, it can easily create DVD folder or ISO files of those videos on your computer.